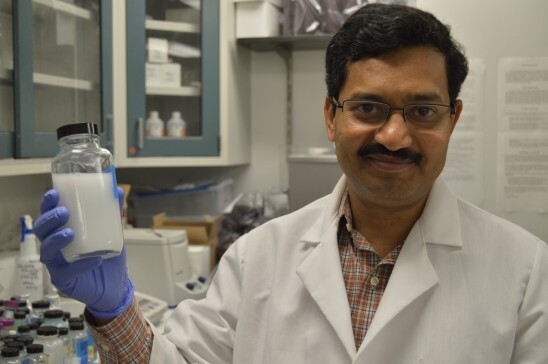 Swadeshmukul Santra of UCF's NanoScience Technology Center invented a tiny particle that could halt the spread of citrus greening. Now the U.S. Department of Agriculture has awarded the University of Florida a $4.6 million grant aimed at testing a potential new weapon in the fight against citrus greening: Zinkicide, a bactericide invented by a nanoparticle researcher at the University of Central Florida. Citrus greening – also known by its Chinese name, Huanglongbing, or HLB – causes orange, grapefruit and other citrus trees to produce small, bitter fruit that drop prematurely and is unsuitable for sale or juice. Eventually, infected trees die. Florida has lost tens of thousands of acres to the disease. “It’s a hundred-year-old disease, but to date there is no cure. It’s a killer, a true killer for the citrus industry,” said Swadeshmukul Santra, associate professor in the NanoScience Technology Center at UCF. The bacteria that causes HLB is carried by the Asian citrus psyllid, a tiny insect that feeds on leaves and stems of infected citrus trees, then carries the bacteria to healthy trees. Zinkicide, developed by Santra, is designed to kill the bacteria. The $4.6 million grant is the largest of five totaling $23 million that were recently announced by the USDA’s National Institute of Food and Agriculture. The evaluation of Zinkicide is a multi-institute project involving 13 investigators from six institutions. Evan Johnson of UF’s Citrus Research and Education Center at Lake Alfred is the project director, and there are a dozen co-principal investigators from UF, UCF, Oak Ridge National Laboratory (ORNL), Auburn University, New Mexico State University and The Ohio State University. A portion of the grant money, $1.4 million, flows to UCF, where Santra leads a team that also includes Andre Gesquiere, Laurene Tetard and the Oak Ridge National Laboratory collaborator, Loukas Petridis. HLB control is difficult because current bactericidal sprays, such as copper, simply leave a protective film on the outside of a plant. The insect-transmitted bacteria bypasses that barrier and lives inside a tree’s fruit, stems and roots, in the vascular tissue known as the phloem. There, it deprives the tree of carbohydrate and nutrients, causing root loss and ultimately death. For a bactericide to be effective against HLB, it must be able to move within the plant, too. Zinkicide is a nanoparticle smaller than a single microscopic cell, and researchers are cautiously optimistic it will be able to move systemically from cell to cell to kill the bacteria that cause HLB. Zinkicide is derived from ingredients which are found in plants, and is designed to break down and be metabolized after its job is done. It’s the first step in a years-long process to bring a treatment to market. UF will lead five years of greenhouse and field trials on grapefruit and sweet orange to determine the effectiveness of Zinkicide and the best method and timing of application. The project also includes research to study where the nanoparticles travel within the plant, understand how they interact with plant tissue and how long they remain before breaking down. If effective, the bactericide could have a substantial role in combatting HLB in Florida, and in other citrus-producing states and countries. It would also likely be useful for control of other bacterial pathogens infecting other crops. The Zinkicide project builds as a spinoff from previous collaborations between Santra and UF’s Jim Graham, at the Citrus Research and Education Center to develop alternatives to copper for citrus canker control.